Port of Hueneme’s first Post-Panamax ship was greeted by Wallenius Wilhelmsen Lines (WWL) company leaders and Port officials during an occasion marking a paradigm shift in how the widened Panama Canal will bring a new class of vessels to the Port of Hueneme. This maiden voyage of the M/V Thalatta marks a new milestone to support the Port’s and its industry partners’ agenda. Thalatta is one of the newest high efficiency Roll on Roll off (RoRo) HERO class vessels designed to increase capacity and flexibility while reducing emissions. 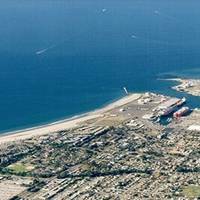 Deputy Maritime Administrator Michael J. Rodriguez today announced that the Department of Transportation will provide $12.3 million for the Port of Hueneme Intermodal Improvement project in Port Hueneme. The project is one of 39 federally-funded transportation projects in 34 states selected to receive a total of $500 million under the Department’s Transportation Investment Generating Economic Recovery (TIGER) 2015 program. U.S. Transportation Secretary Anthony Foxx announced project selections for this round of TIGER grants on October 29. After evaluating 627 applications, 50 of which were from ports, for the FY 2015 Transportation Investment Generating Economic Recovery (TIGER) grants, U.S. Department of Transportation (USDOT) Secretary Anthony Foxx today announced 39 awards for $500 million in funding to be made in the seventh round of this multimodal, discretionary grant program. Of those, five awards totaling $44.3 million, or about 9 percent of total funding, are going to commercial seaports or to projects that directly aid the efficient movement of goods to and from America’s ports. The American Association of Port Authorities (AAPA) applauded Senate passage over the past weekend of the Bipartisan Congressional Trade Priorities and Accountability Act of 2015 (TPA-2015), and today sent a letter to House leadership to urge making passage of TPA-2015 a priority. Trade activity through seaports accounts for 26 percent of the U.S. economy, generates over 23 million American jobs, and provides over $320 billion in local, state and federal tax revenues, the AAPA noted. Today, Governor Brown signed AB 2395 Legislation. The bill was co-authored by Bonnie Lowenthal chair of the Assembly Transportation Committee and the Select Committee on Ports (D-Long Beach); Jeff Gorell, a member of the Select Committee on Ports (R-Camarillo); and Hannah Beth Jackson (D-Santa Barbara). 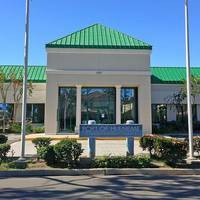 By increasing the Oxnard Harbor District's borrowing authority from its current $1 million to $10 million, the legislation will help The District upgrade and modernize its facilities. 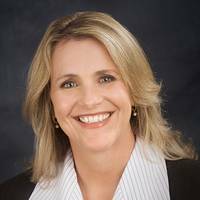 The American Association of Port Authorities (AAPA) informs it has elected Kristin Decas, CEO and port director for the Port of Hueneme (Calif.) as its incoming chair for AAPA’s 2014-2015 activity year. Ms. Decas will take office at the conclusion of the association’s annual convention in Houston in November. “The upcoming activity year will be an exciting one and we look forward to Kristen’s leadership as AAPA continues to address the issues of most relevance and importance to all our member ports,” said Kurt Nagle, AAPA president and CEO. 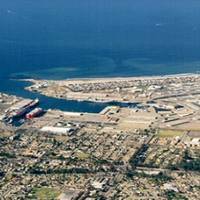 Port of Hueneme, California, informs that a trade delegation is on its way to Latin America, with visits to Peru, Ecuador, and Chile. The Port explains that its trade mission aligns with President Obama’s “Look South Initiative,” launched to make U.S. companies aware of emerging trade opportunities in Latin America and understand the resources available to help them penetrate these markets. 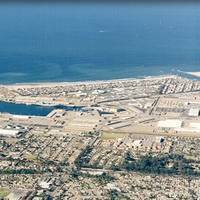 The Port of Hueneme is one of the most productive and efficient commercial trade gateways for niche cargo on the West Coast. The Port is governed by 5 locally elected Port Commissioners. 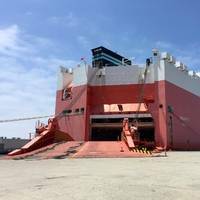 The Port commissioned the Hamburg Sud’s M/V Cap Palmerston, carrying fresh fruit for Chiquita Brands of Charlotte, North Carolina during a ribbon cutting ceremony to introduce the Port of Hueneme’s recently installed Grid-Based Shore Power system. Community leaders were on hand to view this first vessel ‘plug in’. The initial test of ‘plugging in’ a vessel is critical to assessing the performance of this new and very high voltage shore power system. It is also vital to ensuring all trained units including ILWU and ship operators become comfortable with operating the gear. The Port informs that it has conducted its first operational and safety vessel test of its recently installed Auxiliary Maritime Power (AMP) system. Port crews were on hand to view this first vessel ‘plug in’ by Hamburg Sud’s 'M/V Cap Pasley', carrying fresh fruit for Chiquita Brands of Charlotte, North Carolina. 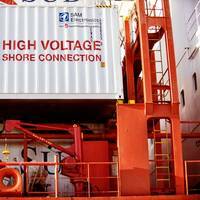 The Port of Hueneme explains that the initial test of ‘plugging in’ a vessel is critical to assessing performance of this new and very high voltage shore power system. Port staff received news that the Port of Hueneme was among the awardees to receive funds through the EPA’s Diesel Emissions Reduction Act (DERA). The funds will be used to complete an enhanced phase II to the Port’s existing Shore Power Project that will allow additional vessels to simultaneously connect to the Port’s Shore Power system. 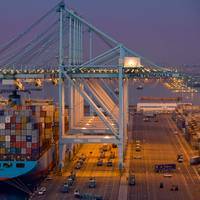 Following passage of AB 32 by the state assembly, programs were put in place to allow ships at berth in California ports to turn off their more polluting marine engines dramatically reducing greenhouse gas emissions. The Port of Hueneme conducted its first operational and safety vessel test of its recently installed Grid-Based Shore Power system. Port crews were on hand to view this first vessel ‘plug in’ by Hamburg Sud’s M/V Cap Pasley, carrying fresh fruit for Chiquita Brands of Charlotte, North Carolina. The initial test of ‘plugging in’ a vessel is critical to the assessing performance of this new and very high voltage shore power system. It is also vital to ensuring all trained units including ILWU and ship operators become comfortable with operating the gear. The process tests the vessel’s ability to synchronize with and connect to the Port’s grid-based system. Acting Maritime Administrator Paul “Chip” Jaenichen met today with Port of Hueneme officials and Port customers for an industry stakeholder meeting and tour of the Port of Hueneme and Navy Base Ventura County. BMW, Global Auto Processing Services, Wallenius Wilhelmsen Logistics, Chiquita, Del Monte, Yara, the ILWU and Port Stevedores participated in a strategic round table discussion focusing on partnership opportunities, marine highway trade and Port priorities moving forward. “America’s Ports truly are our economic gateway,” said Acting Maritime Administrator Paul “Chip” Jaenichen. 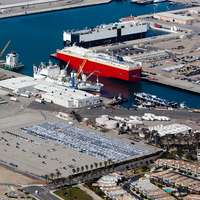 The Port of Hueneme, claimed to be one of the most productive and efficient commercial trade gateways for niche cargo on the West Coast, is to be visited by the Acting Maritime Administration (MARAD) Chief, Paul ‘Chip’ Jaenichen. 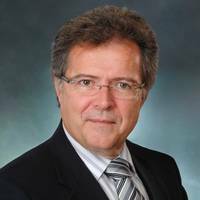 The Port informs that Mr. Jaenichen is to tour the port and visit with working waterfront port customers at 1000 hrs. on February 24, 2014. The Port is governed by 5 locally elected Port Commissioners. The Port moves $8 billion in goods each year and consistently ranks among the top ten U.S. ports for automobiles and fresh produce.